The Guardian’s Daniel Taylor writes about Manchester City 10 years on form the Abu Dhabi ownership takeover. Joel Embiid tells his story for the Players Tribune. 3. “On Wednesday morning, the start of his third day as an All-Ireland senior hurling medal holder, Nickie Quaid makes his way down from his hotel room in Adare. The Irish Independent’s Dermot Crowe looks at Nickie Quaid’s tribute to his father. ESPN’s Seth Wickersham on Odell Beckham Jr’s quest to recapture the magic that made him the NFL’s most eye-catching talent. 5. “He drove a hard bargain, because he knew desperate men will pay a premium when the clock is counting down on All-Ireland final day. My father handed over the necessary. It was the first of September, 1974. I was nine years old and about to see my first game of hurling: Limerick, the All-Ireland champions, versus Kilkenny. Family matters most on a day sent to us from heaven, writes The Limerick Leader’s Alan English. 6. “It’s ironic that when the shock call came for Paddy Quinn to join the Dublin footballers in the autumn of 2012, it was from a fellow Tyrone native and Jim Gavin’s trusted lieutenant Michael Kennedy. The Irish Independent’s Michael Verney chats to The Tyrone man who played for Dublin. The Ringer’s Shea Serrano reflects on the retirement of a legend, Manu Ginobili. Growing up in Tyrone, GAA offered a way of expressing our Irishness that allowed us to feel a part of it despite our political circumstances, writes the Irish Times’ Una McCaffrey. 9. “Michael still wanted to come back even when his time at Newcastle was over, but Liverpool had moved on. There was to be no dream move. “Hundreds of tweets describe this story as “honest” and “revealing”, adding that there was a palpable sense of disappointment in his voice due to his love of the club. Maybe he was hard done by after all. “Sorry Michael, but I remember things differently. 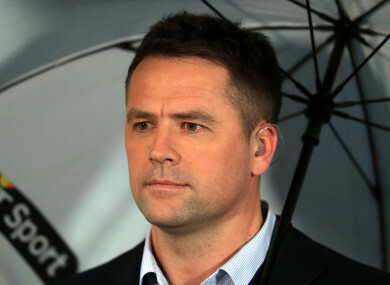 Karl Coppack of the Anfield Wrap on the reality of Michael Owen’s Anfield departure. Email “Michael Owen's 'dream' of a Liverpool return, the Tyrone man who played for Dublin and all the week's best sportswriting”. Feedback on “Michael Owen's 'dream' of a Liverpool return, the Tyrone man who played for Dublin and all the week's best sportswriting”.